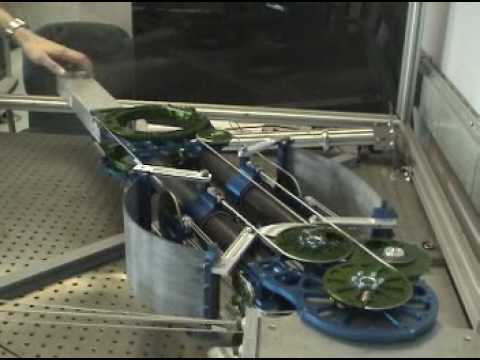 Single-port surgical tasks performed by a 14-DOF robot which has been deployed solely by umbilical access. 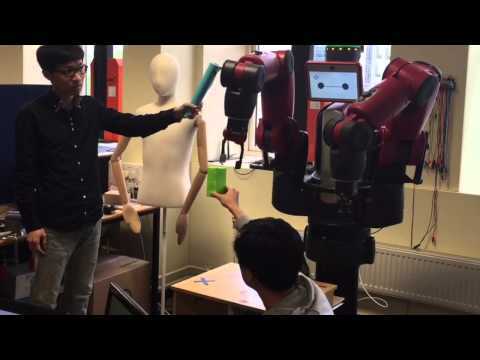 Visual servoing control rby an obstacle avoidance strategy using kinematics redundancy has been developed and tested on a Baxter robot. A Point Grey Bumblebee2 stereo camera is used to obtain the 3-D point cloud of a target object. The object tracking task allocation between two arms has been developed by identifying workspaces of the dual arms and tracing the object location in a convex hull of the workspace. By employment of a simulated artificial robot as a parallel system as well as a task-switching weight factor, the robot is actually able to restore back to the natural pose smoothly in the absence of the obstacle. Two sets of experiments were carried out to demonstrate the effectiveness of the developed servoing control method. 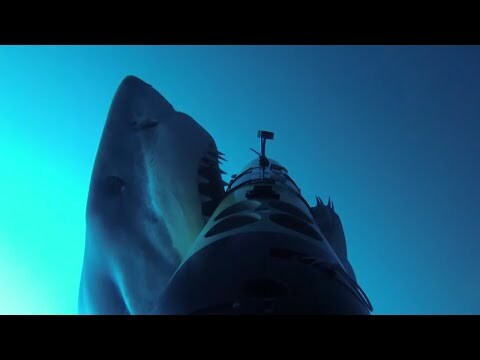 In 2013, a team from the Oceanographic Systems Lab at the Woods Hole Oceanographic Institution took a specially equipped REMUS SharkCam underwater vehicle to Guadalupe Island in Mexico to film great white sharks in the wild. They captured more action than they bargained for. The ReWalk is a legged exoskeleton designed to help people with paralysis to walk. Author Jonathan Hurst et al. AMASC variable stiffness actuator: changing stiffness phase. PAM is a 5-DOF pneumatic, gait-training robot which can assist a person with paralysis in walking naturalistically over a treadmill. 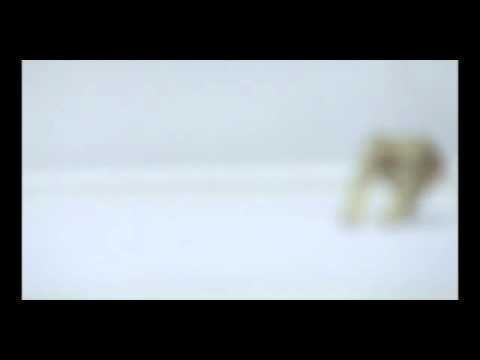 PAM in this video is coupled with POGO, an pneumatic leg exoskeleton. PAM is compliant and automatically synchronizes to the patient's gait cycle using pattern recognition and time warping. PAM was developed at the University of California at Irvine. Bruno Siciliano, Editor of the Springer Handbook of Robotics, gives an interview during the One SpringerNature event in Barcelona on 7 February 2017. Mowing and spraying are two common tasks in orchard environments that require the use of tractors. These tasks take significant time and resources and spraying, in particular, can be dangerous for the operators, all of which suggest benefits from their automation. This video shows two John Deere tractors driving autonomously in an orange orchard. The first tractor is performing a spraying task, using the perception sensors for obstacle detection and to control the amount of spray applied to the trees, such that each tree receives only the minimum amount of chemicals necessary for its size. The second tractor is performing a mowing task, keeping the grass short to improve access to the orchard and reduce competition for resouces with the trees. 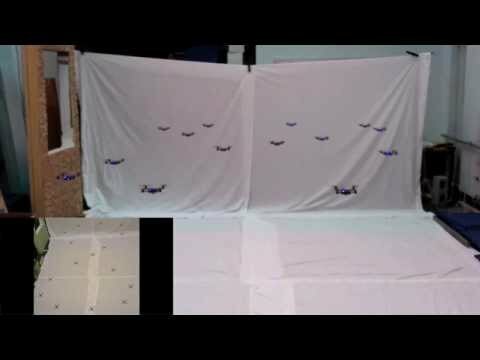 This video shows experiments performed with a team of nano quadrotors at the GRASP Lab, University of Pennsylvania.